Congratulations to Karole Turner Campbell (KTC) whose mixed media piece, Jubilee, was chosen as the North Charleston Arts Festival 2015 Design Competition Winner. 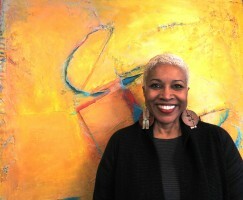 Her piece will be used as the promotional artwork for the 2015 North Charleston Art Festival (May 1- May 9), and will become part of the City’s Public Art Collection. KTC competed against forty-seven South Carolina artists entries, and the entries were judged on quality, originality, appeal, and if it conveyed the festivals spirit. The retired NYC principal describes her vibrant mixed media work, “as a pun that explores a different approach to color theory”. The materials that she used to create Jubilee include acrylic and oil paints, reused Styrofoam, and paper. Her color palette, use of texture, range of materials, and abstract forms allow her to explore her creativity. 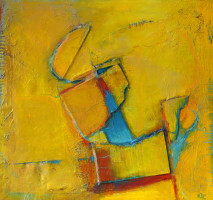 KTC describes the abstract subjects as a blue island “floating and dancing amidst a yellow sea”. KTC retired to the Charleston, and now works as a full time artist creating 3D, colorful, mixed media works in order to push her self-expression and viewer engagement to the next level. She earned a BA in Art Education from North Carolina A&T State University and a MFA in drawing and painting from the City University of New York. KTC is extremely involved in the Charleston art community as she has curated shows for the MOJA festival and the Avery Center. Her work has been displayed at local venues such as the City Gallery at Waterfront Park, the Charleston Public Library, the Charleston Artist Guild Gallery, and the North Charleston City Gallery. Jubilee will be printed on t-shirts and posters available for sale during the North Charleston Arts Festival. Posted on February 18, 2015 by admin.